Bose's latest release is a wireless pair of earbuds designed to help you sleep. Sleepbuds block sound — first through the seal created by the earbud tip, and then by playing relaxing sounds controlled via a mobile app. Living in a city, sleeping next to a snoring partner, or having noisy neighbours is likely to affect your sleep. That's the reasoning behind Bose's latest release, the R3,300 ($250) noise-masking Sleepbuds. The Sleepbuds are low profile and designed to comfortably sit in your ear all night without falling out. The ear tip, which comes in three sizes, helps block external noise, and the preloaded sounds on the device's memory chip help mask the rest that might leak in. There isn't any active noise cancellation in the headphones, something Bose engineers at a press event said was to save space. The simplified design, including a small silver-zinc battery with up to 16 hours of life, allows the Sleepbuds to have a diameter smaller than a penny. They are designed to be comfortable while you lie on your back or your side, something that isn't always possible with wired or wireless headphones. The Sleepbuds are meant to be paired with the Bose Sleep mobile app, which acts as a remote for the Sleepbuds' sounds. So far, there are 10 preloaded sounds, including ocean and forest noises, but the company plans to add more. These earbuds were not designed for listening to music or podcasts — only for sleeping or relaxing. If music functionality were included, the Sleepbuds wouldn't have been as low profile, Bose engineers said. 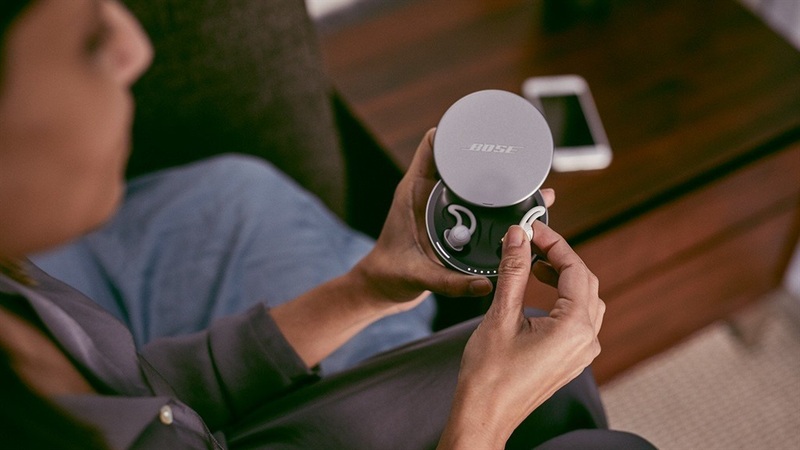 Through the Bose Sleep app, users can choose the sound they want to play and its duration, and they can set an alarm to wake them in the morning. The engineers said they were concerned about the potential for hearing damage from after night after night of wearing earbuds playing sound, so they said they made sure to keep the maximum volume well below the upper limits where damage starts to occur. The Sleepbuds come with a storage case that also serves as a charging station, which uses a mini-USB cable. Unplugged, the case can hold an additional 16 hours of battery life for the earbuds.